It doesn't matter if you do woodworking, metalwork, or DIY home repair, one tool that you need to have in your shop is a heavy-duty vise; and when we think vise we think of Wilton. If you have a Wilton vise story, Wilton wants to hear about it. 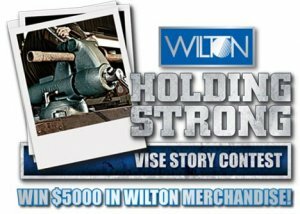 Your story and vise photo could win you $5000; but even of you don't win, Wilton will still give you one of their c-clamps (value $84). Wilton has been around for 71 years now, and there is probably a pretty good chance that you have used one of their vises in your lifetime. If you are like me, you might even own one that has been around for decades that you picked up second (maybe third) hand. Be sure to read the complete rules from the contest page.